A few years ago we remodeled our kitchen for just around a thousand dollars. Of course that price did not include the appliances or new cabinetry. 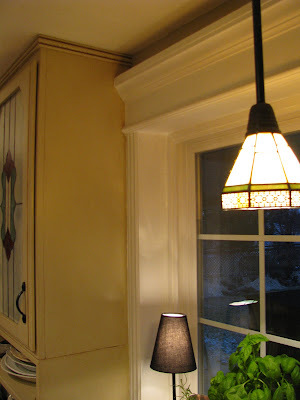 But it did include light fixtures, beadboard, glass, primer, paint, glaze, poly, granite tiles, grout and all the materials for the new underlayment that's required when you tear off the existing counter tops. Then there was the cost of the trim at the top of the cabinets, tile for the edging, and hardware for the drawers and doors. And when it was finished I was pretty proud of our "new" old kitchen. However, there was one element that I felt we could improve on if we could find another bargain. The white hardware. 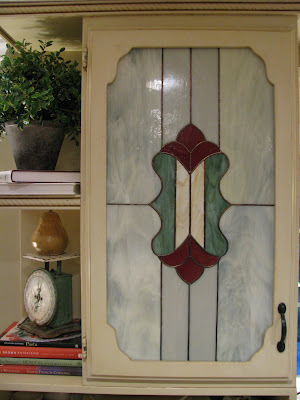 and the lead on the stained glass door. I think the kitchen is complete. . . .
at least until we get weather warm enough to throw open the windows and break out the paint brushes because there's just one more element that I need to improve upon! OOooh, what a score!! THose black ones are SO beautiful!! I can't knowingly pass up any bags of hardware!! Fab find and it looks like a million bucks!! Great find! Have a great week. Your cabinets looks wonderful! I'm guessing you painted them yourself, Joy. Did you have a post on it that I could search out? I'm trying to get as many pics together to convince my hubby to let me do our oak cabinets in a cream with glaze like yours. Great find on the hardware ~ the black looks great. The black handles look great! What a lucky find to get them at the thrift store too! Stop over for my giveaway if you are interested. Looks great! What a great find. A perfect of example of how waiting and patience can really pay off. 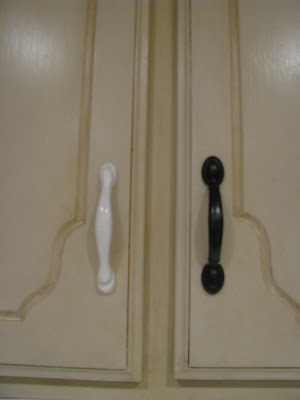 I'm adding to Kathy's request regarding a "how-to" post on how you renovated your cabinets if you did it yourself. I'm so longing to change our oak finish to a lighter, brighter finish like yours. Cabinet jewelry is so important! What a great find at the thrift store!! It sure does make a tremendous difference. The new handles look really great! It's so awesome that you were able to find them at the thrift store! Great find! You could always spray the white ones for whatever color you need. Glad the black ones match your fixtures! Great find! What a difference,looks perfect! Everything looks so nice. It is a mess to redo a room but so worth-while when all is finished. what a great find! The new handles are a wonderful finishing touch. Oh i love it. I'm on the hunt for some hardware goodies for my kitchen too. The new hardware looks great! I'm currently content-ish with my kitchen, except for the brassy hardware. I've been considering just painting it with some ORB spraypaint, but I sort of consider you to be the queen of spray paint. Would advise against this move? I love the black handles!! What a great find! You kitchen looks lovely! I love the black handles. And the stained glass is beautiful. Did you make those? Wow! !